I love Dates and I love Smoothies. 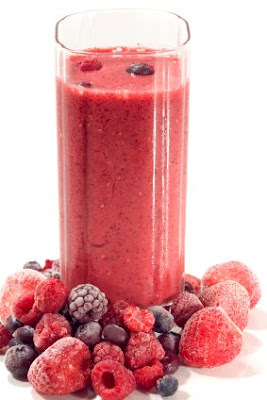 Smoothies are a great way to get more anti-oxidant rich fruits into your diet. Smoothies are easy to make, can be really tasty, and can be given to children as a "sweet" way to get more nutrition into their diet. Fruits are loaded with fiber, minerals, and nutrients and increased consumption of many of these fruits can help prevent infections and decrease your risk of just about every disease you can think of. I am a big fan of berries so this smoothie recipe below will contain lots of berries which are usually very high in immune boosting Vitamin C.
Dates are on the other hand are a delicious fruit that is native to the Middle East. They are extremely sweet and rich in nutrients. Dates are a good source of fiber, calcium, potassium, B-Vitamins, magnesium, protein, and abundance of trace minerals like copper and magnesium. I recommend everyone use Dates in their smoothies instead of isolated sweeteners like agave, maple syrup, or regular sugar. I recommend purchasing strawberries and raspberries organic due to the high levels of pesticides used on them. Add the ingredients to a blender with water and blend. Enjoy! The recipe serves 1 to 2 people. Note: To make the smoothies more "berry" and beneficial for the immune system, you can add 1 tablespoon of Elderberry powder. Elderberry is an berry which is beneficial in boosting the immune system and preventing colds and flus. Elderberry is also a great natural remedy for the cold or all flus. Elderberry is also rich in anti-oxidants and contain twice as many as blueberries.